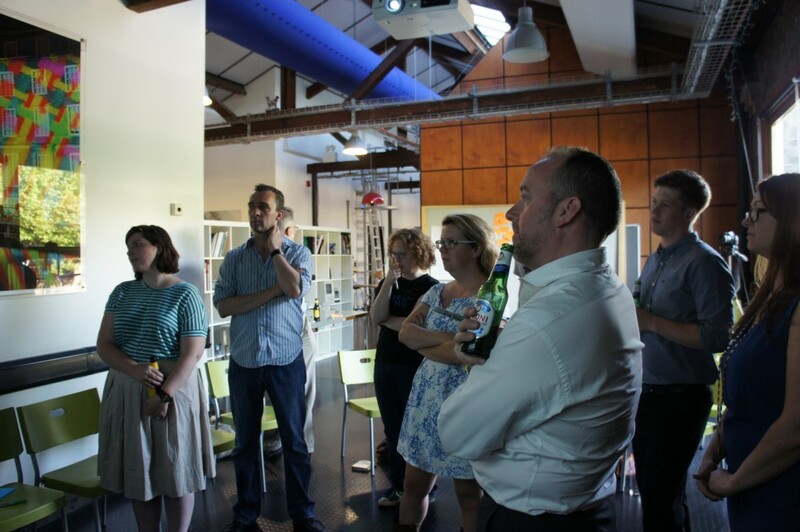 Last Thursday we held the second Minimum Viable Book workshop in the very wonderful Pervasive Media Studio in Bristol. Many thanks to our lovely hosts, Clare, Hannah, Verity and Tom. We ran over-time in our last session, so this time we asked everyone to vote and prioritise the topics so we could cover the things they were most interested in first – we planned to run out of time again. 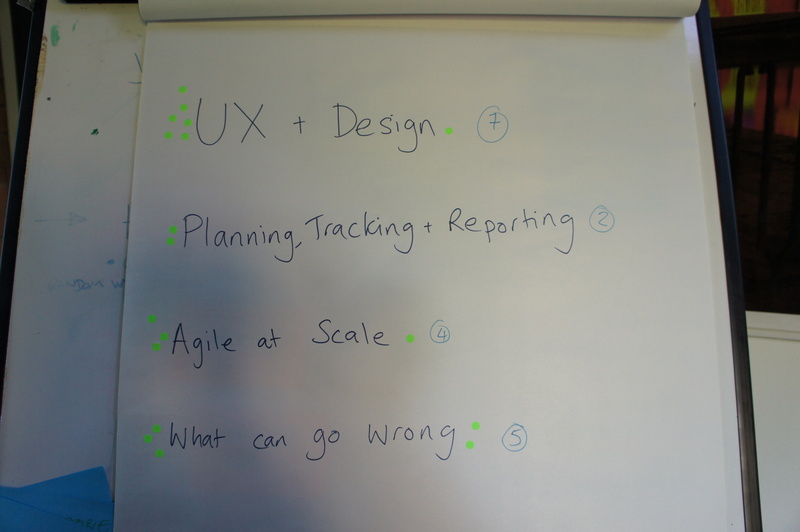 Interestingly, the group chose to cover two of the same topics as London: UX and Design and What can go Wrong. We received some feedback from a few London participants who said they were most interested in discovering stories of Agile that were both real & scenario-based. So for Bristol, we changed the format of our exercise ‘The Three Cs’ (loosely based on ‘The Four C’s’ from every workshopper’s bible, Gamestorming) so that the output from the exercise was a story of adversity with an outcome. It morphed into a fun exercise that was much easier to explain to the group. 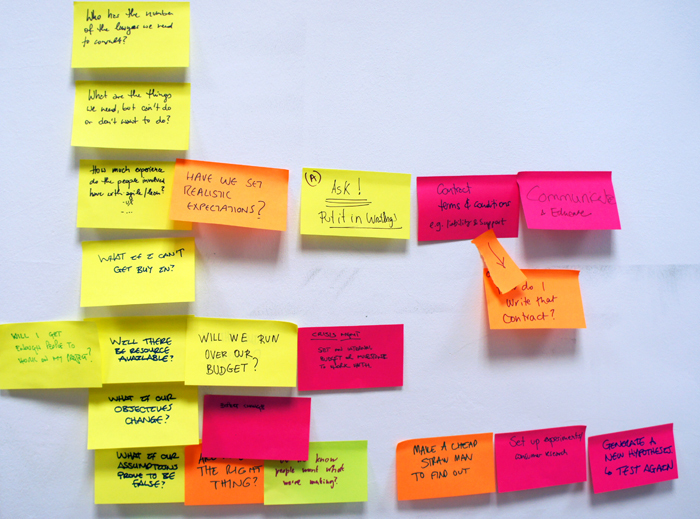 There were too many up-front post-it ideas generated for a few of the exercises in London, so we limited the amount of ideas we asked people to generate in Bristol. This meant we could get further through a few set issues and delve into juicer conversations during the exercise. This, combined with breaking into two groups meant ‘The Squid’ exercise was much deeper and raised some interesting insights. Again, we felt we had a great mix of people ranging from those working in digital inclusion, architecture (physical world! ), web development and health. These varied backgrounds helped create some really interesting discussions and scenarios like ‘how do you create a hackable radio that someone with visual impairment can assemble’? Thanks to Libby Miller, Laura Chilcott, Steve Maslin, Pete Britten, Tom Abba, Kevin O’Malley, Annie Taylor, Dave Martin and Kerry Bradshaw. Thanks everyone for coming along and making it a great event, we’ll definitely be back to Bristol to see you all soon. Now that we’ve collected two workshops worth of information & ideas, we’re starting to get an emerging picture of how we might best structure the book. Last Tuesday we spent a few hours on a very warm evening in the offices of Go Free Range London, for our first Workshop. The group were a diverse bunch covering crafts from beer brewing, theatre production, content strategy and software development and each attendee had a wide range of experience with making things happen. The goal of the workshop was to gather insights, stories and opinions on our top chapter themes: What can go wrong and when not to use Agile; Agile UX and design; and Agile at scale, Planning, tracking and reporting. And well, we certainly gathered a lot of info. Everyone was keen to share their experiences with each other and we weren’t short of points on post-it notes. Due to time constraints and the (often very interesting and helpful) tangents of conversation in the group, we decided to drop a topic mid-way through the workshop. We’d like to tackle the topic we missed – agile at scale – via one-on-one interviews with people who are trying it out (if that’s you, please get in touch). We’re considering tackling less topics next time so we can plan for these useful meandering threads of conversation. Next steps for us will be to write up, filter and distill these insights into a format that will help us compare the London workshop data with our future workshop data. The next workshop will be held in Bristol and we are keen to hear from you if you want to get involved. HUGE thanks to our workshop participants: Tom Stuart, Johanna Kollman, Sarah Butcher, Jesy Wittebort, Stuart Cullum, Chris Roos, Neil Hinchley, Elizabeth McGuane, Aanand Prasad, Mat Munro and Elvia Vasconcelos who all bared their souls and shared their own stories of making things and getting things done. Hi folks. 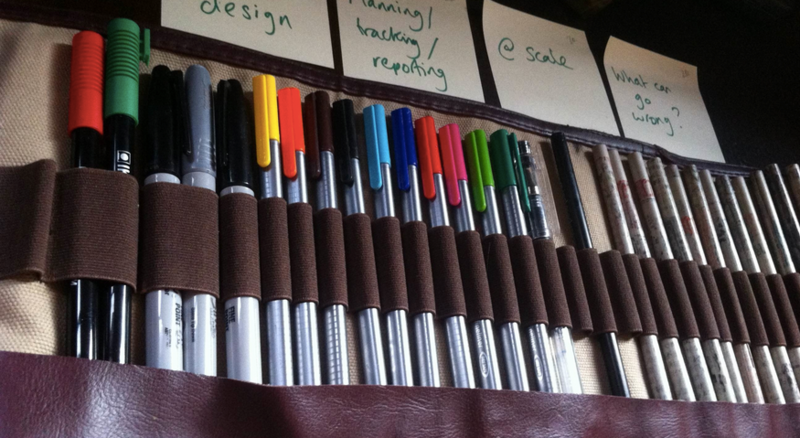 This week we’re excited to announce our our first Minimum Viable Book Workshop plans. Before we tell you all about it, here’s a quick note about how we’re selecting the workshop attendees. We’ve had a great response and we’ve received lots of names and messages via our contact form – thank you! This is really encouraging. We will be shortlisting people who have registered their interest to attend our workshops so we can cover a range of skillsets and industries. If you’re not selected for a workshop, don’t worry. There will be plenty of opportunities to input & share stories via our surveys and one-on-one interviews. Stories from you are going to be a big part of this. Please keep in touch. What better place to start than in our home town? Hopefully this will give us a chance to hone the format a little in front of a home crowd. Thanks very much to Go Free Range for lending us your lovely Shoreditchy office space for the occasion. We’re on the look out for a suitable location, but we have our Minimum Viable Book mate Libby on hand with tips. Stay tuned for more deets. If you’re in Bristol, please get in touch. This is where things get a bit more fuzzy. In true agile style, we’re focusing our planning attention on the nearer tasks. If you’re in Berlin, please get in touch. Again, very fuzzy details. Stay tuned. If you’re in Austin, please get in touch. So as you can see, the real work is about to commence. As always, we’ll keep you posted. Thanks so much to everyone who took time to fill in our poll about chapters, we had over 50 of you respond. What can go wrong and when not to use Agile: The warning signs and when Agile doesn’t fit. Agile UX and design: How can UX and design fit with agile development? It does, we promise. Agile at scale: Implementing Agile to manage a chunky programme, portfolio or organisation. Planning, tracking and reporting: Waterfall isn’t the only way to get the governance processes your Stakeholders need. We’ll explore what you can do to measure progress, gauge insights and how to constantly learn as you go. For us, this means that our first workshops will focus on the top 4 themes. That doesn’t mean we won’t include other themes, but these are what you (the users) have told us are the most important. In our next post we will announce the workshops. 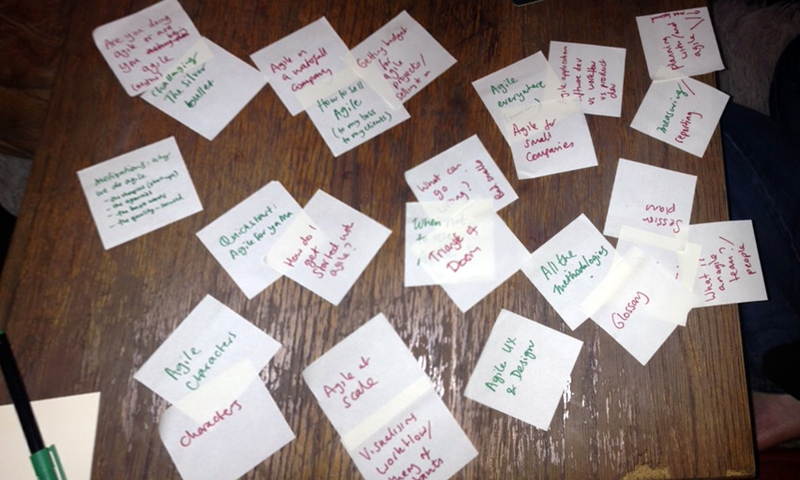 This week we spent some time workshopping chapter themes and now we would love your input. These chapter themes are going into a list we’re calling the Chapter Backlog. We’ll add ideas and hone this list all the time, but we’d like you to prioritise them for us. We are writing this book for you afterall. The current Chapter Backlog is below and this is your chance to tell us what you most want us to write about. If you think we’ve missed something important, then please feel free to add a comment. OMG! We’re writing a book! As promised, we intend to blog about our process of writing the Minimum Viable Book and this is the first of many posts to come. It felt right to kick off our process with an activity to understand why we want to do this project, so today’s post explains how we captured these insights. The first activity from our agile toolbox was a post-up brainstorming session which we completed together in Amy’s kitchen. We agreed on a few topics to cover that would help us understand why we want to do this project and what we hope (& fear) the outcomes will be. What’s it going to contain? We have an idea, but we don’t know for sure yet. We’ll be using agile techniques to plan and write it, asking for input from others and testing it with users along the way. Sign up to the mailing list to keep up to date.